Already own a home in the Sunset Bay subdivision? Thinking of selling? Click here and read about current search trends & our web network. Sunset Bay at Bon Secour is a great little subdivision on County Road 4 West. The homes are reached from taking County road 4 going West at the base of the intracoastal bridge when entering the island of Gulf Shores, AL. The community shares deep water access in Oyster Bay through Bon Secour Bay and then Mobile Bay to the Gulf of Mexico. The water access is very sheltered and the trip to the Gulf of Mexico takes a little while, but it's a great smaller subdivision with moderate to high-end homes. 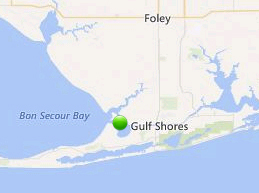 Sunset Bay at Bon Secour is very close to highway 59 and the Gulf Shores beaches are only minutes away. Orange Beach, AL is approximately 20 minutes away and the Wharf and amphitheater is one of the first venues passed when traveling East on Canal road. The "Track" in Gulf Shores is a great area entertainment destination and only about 5 minutes from Sunset Bay at Bon Secour and numerous other local area attractions are also only minutes from the subdivision. Please let us know if you would like additional info such as, pictures, subdivision bylaws, recent sales figures by emailing info@condoinvestment.com or call (251) Area-Pro (251-273-2776) for immediate assistance or to schedule appointments to view current listings in Sunset Bay at Bon Secour or other properties in the area.